Almost everyone can get away with a short hairstyle. Some styles work better with certain face shapes and hair textures. Your haircut should give you the illusion of having an oval face shape. If you have a round face you'll want to elongate it. We make hundreds of decisions every day from where to eat to who to date, all of which can be taken risks with. But, when it comes to getting a haircut, we tend to take the safe route. Like always! If you’ve been wearing the same old haircut ever since your brace-face days, it’s time to ditch your styling rut. Go shorter! Wearing short hair makes you a lady of confidence and shows that you are comfortable in your skin. It can accentuate your best features and is a much safer risk than dating that unemployed, couch-surfing musician. But, how do you know which short haircut will suit your face shape? Because after all there are so many options available; from symmetrical bob to asymmetrical bob and pixie to pompadour cuts. Whichever face shape you have–round, oval, long, square or heart-shaped, there always will be styles that will look great on you and others that won’t look as flattering. But, the good part is, every trend has variations to go with every face shape. You just have to get the right haircut according to your face shape. So, people with a round face won’t feel as great in a pixie cut, but it can be adapted according to the face shape. So, you could wear short bangs sticking up or grown down in a side-sweep, making the pixie look flattering on your face shape. Another thing that plays a starring role in the drama “how to choose a flattering haircut” is your hair texture. How your hairstylist cuts your hair is influenced by your hair’s density, texture and length. 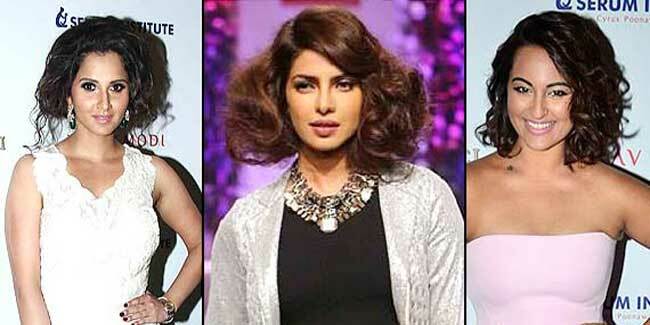 So, like all short hairstyles won’t look gorgeous on curly hair, not all will look nice on super fine, flat hair. While most people can don long or wavy hair with confidence, your personality plays a huge role when you decide to cut your tresses short. Think about how you feel when you see a woman with a symmetrical bob or an edgy haircut. You probably pass a judgement on her, depending on whether you liked it or not. You might find her cool or sophisticated or funky or a tad over-the-top. That is your deciding factor. Also consider that short hair draw more attention than long hair so prepare to get noticed a lot if you’re getting a platinum pompadour. If you enjoy attention, go for it; if you don’t, think twice. And now that we have helped you make up your mind, let’s get onto the fun! P.S. Do let us know which haircut you got in the comments below.